Essential tremor (ET) might be a family of diseases unified by the presence of kinetic tremor, but also showing etiological, pathological, and clinical heterogeneity. In this review, we will describe the most significant clinical evidence, which suggests that ET is linked to the cerebellum. 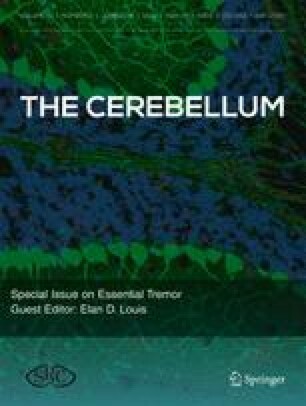 Data for this review were identified by searching PUBMED (January 1966 to May 2015) crossing the terms “essential tremor” (ET) and “cerebellum,” which yielded 201 entries, 11 of which included the term “cerebellum” in the article title. This was supplemented by articles in the author’s files that pertained to this topic. The wide spectrum of clinical features of ET that suggest that it originates as a cerebellar or cerebellar outflow problem include the presence of intentional tremor, gait and balance abnormalities, subtle features of dysarthria, and oculomotor abnormalities, as well as deficits in eye-hand coordination, motor learning deficits, incoordination during spiral drawing task, abnormalities in motor timing and visual reaction time, impairment of social abilities, improvement in tremor after cerebellar stroke, efficacy of deep brain stimulation (which blocks cerebellar outflow), and cognitive dysfunction. It is unlikely, however, that cerebellar dysfunction, per se, fully explains ET-associated dementia, because the cognitive deficits that have been described in patients with cerebellar lesions are generally mild. Overall, a variety of clinical findings suggest that in at least a sizable proportion of patients with ET, there is an underlying abnormality of the cerebellum and/or its pathways. Dr. Benito-León is supported by the National Institutes of Health, Bethesda, MD, USA (NINDS #R01 NS39422), the Commission of the European Union (grant ICT-2011-287739, NeuroTREMOR), and the Spanish Health Research Agency (grant FIS PI12/01602).